BeGreen from Pilot is the world's first line of earth-friendly writing instruments. All BeGreen products are composed of at least 70% recycled industrial waste material. They can be part of your everyday commitment to making the planet cleaner and healthier. Made from 89.2% recycled content, this rolling ball pen features a unique liquid ink formula that maintains consistent writing strokes and patented precise needle point technology. The visible ink supply lets you see how much ink is left. Refillable. Black extra fine point (0.5 mm). Each package contains two pens. Precise V5 Rolling Ball Pen — Made from 89.2% recycled content, this rolling ball pen features a unique liquid ink formula that maintains consistent writing strokes and patented precise needle point technology. The visible ink supply lets you see how much ink is left. Refillable. Black extra fine point (0.5 mm). Each package contains two pens. ® Pilot is a registered trademark.® BeGreen, Precise, and V-Ball are registered trademarks. Three years in the making, the BeGreen product line represents Pilot's commitment to providing environmentally friendly writing instruments with the same innovation, technology, focus on quality, and pricing as its non-recycled products. 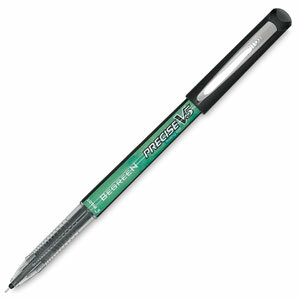 Each Pilot BeGreen writing instrument is made from at least 70% recycled industrial waste materials. All products meet or exceed ISO-14001 and ISO-14021 standards for environmentally responsible production. Even the packaging materials are made from recycled board. Here's how BeGreen works: Post-industrial material is collected, and then fed through a shredder in a recycling plant. The plastic is melted and cut into pellets, which are then shaped and reborn as Pilot BeGreen products. Scraps from production of BeGreen products are collected and the process starts all over again!